Christmas lights started out using the large lights consisting of C5/C7 bulbs. These are nice bright lights, but they consume a lot of power or about 3 times a set of 100 bulb mini lights. These bulbs can be turned on and dimmed as a whole string, and you are limited to the color of the bulbs. 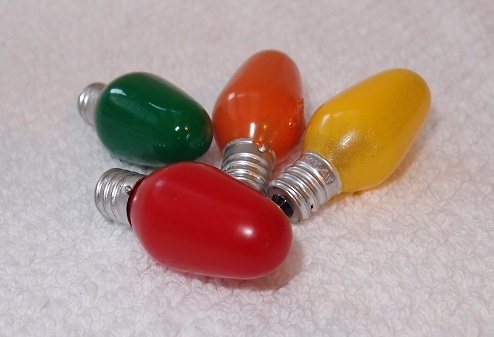 The mini lights come in various lengths, 35, 50, 70, 100, 150 are all common. However, the 35 and 70 foot lengths use 3.5V bulbs, and the 50/100/150 sets use 2.5V bulbs. I would recommend buying the same voltage bulbs to make it easier to repair easier. A set of 100 of these bulbs consumes about 0.42 amperes or 50W of power. These bulbs can only be turned on as a set or group. The mini lights and large bulbs can be bought with LED lights. They function the same as the incandescent strings, but require much less power. A string of 70 led lights requires about 5W of power. However, they cost more than standard light strings. Be sure that you buy a warm color temperature for the white lights. The next step up in lighting is the dumb LED strips. These type of lights are powered off of DC power, which is generally either 5V or 12 V. These strips can also be all one color that can be dimmed together, or they can be a RGB strip that is three channels, one for each of the red, green and blue colors in each bulb. This strip can be controlled to output any color along the whole strip. The last type of light is what is called a smart string of LED’s, each of the lights within the string can be any color and brightness. These type of strings can be used to display images and are only limited by your imagination. Below is a table comparing the different types of lights. Within the RGB lights there are both 12V and 5V power lights. This is discussed further under power and wiring.